V NAŠÍ ŘADĚ JSME POSTRÁDALI BOILIES S VYSOKÝM OBSAHEM MOUČEK A ATRAKTANTŮ Z TUŇÁKA . VZNIKLA TEDY TATO NOVINKA, KTEROU JSME VYŠPERKOVALI MAXIMÁLNÍM MOŽNÝM DÁVKOVÁNÍM ŠPANĚLSKÉHO PEPŘE. VĚTŠINU SUROVIN SI VOZÍME PŘÍMO Z TOVÁRNY NA ZPRACOVÁNÍ MOŘSKÝCH RYB A DALŠÍCH ŽIVOČICHŮ . ODTUD POCHÁZÍ I TATO VELMI AROMATICKÁ MOUČKA Z TUŃÁKA. ŚPANĚLSKÝ PEPŘ DODÁVÁ TOMU BOILIES UNIKÁTNÍ KOŘENITÉ AROMA. SVOU MIMOŘÁDNOU ÚČINNOST UKÁZAL PŘI TESTOVÁNÍ NA PÁLAVSKÝCH JEZERECH, ALE I NA ZAHRANIČNÍCH REVÍRECH. New boilies, made by maximum possible dosing Spanish pepper and tuna flour. Main raw materials comes from the fishery faktory. 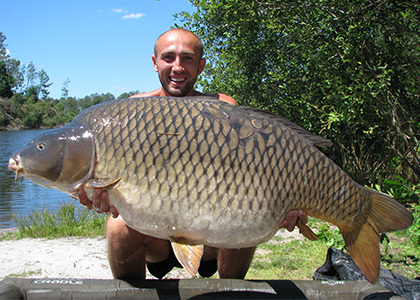 Boilies has got unique root aroma thanks to spanish papper. Their extraordinary effectiveness has been determined in testing on the Lake Novomlynska, and foreign reverses.